I am not inspired by music, literature, films, art, ballet – I am inspired by myself. In my free time I like wearing shirts and ties. I would like to have more clothes with really good quality, but they are really expensive and cannot be found in Estonia. Last thing I bought was GSUS's sweatshirt. FashionTV has always been my secret passion. I like to see what the overall trends of next season are and wear them before they hit high street. People sometimes look at me as I were crazy, but I do not care, because I want to show that it is cool to be different. I love wearing colourful clothes, but I want colours to match, e.g. today I am wearing different shades of green. I absolutely hate when people wear colours that do not look right together. My style icons are Heidy Purga and Sienna Miller. My outfits have to be theatrical and original. One of my hobbies is acting and my friends are also very artistic, therefore I get most of my inspiration from this creative atmosphere. I like wearing colourful clothes, because I want to be seen. I cannot talk about having one particular style. I want it to change very often, otherwise I’ll just get bored. I am trying to get some bands’ T’s, but otherwise I don’t have anything special I want to wear this spring. Estonians, be less laconic in your style! I have no rules when it comes to fashion. It doesn’t matter if something is initially meant for men or women, if I like it, then I’ll get it. As I am a stylist and a designer, fashion is an important part of my life, but very often after styling some outfits for magazines, I don’t want to wear them myself, because these trends quickly become boring for me. I have been visiting Paris quite often and I think my style is affected by Parisians and also by Kate Moss. 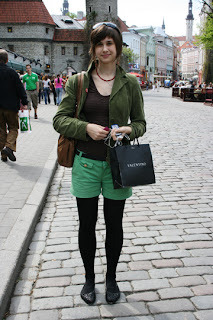 I make most of my shopping there, but in Tallinn I go to Mango and Zara. I try to be chic and trendy, yet I wear comfortable clothes. 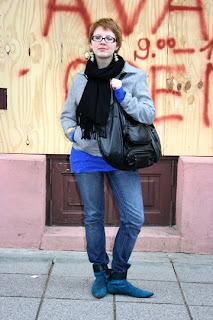 Today I am really relaxed, but usually I wear tighter clothes and jeans. 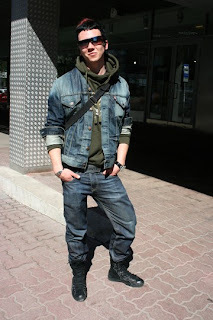 Jeans, especially Levi’s, and different boots are an important part of my style. Ideas and inspiration comes from my head - I never know what I’ll wear next. 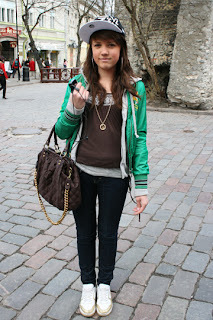 There are way too many chavs in Estonia, but this makes it easier to be cool. I am feeling for minimalism at the moment, but I get inspired now and then by different decades. One day I go for 60’s, another 80’s. I have been in these clothes for so long, I don’t know how many days I have worn these stockings. I like doing people watching, but I can get pretty critical. 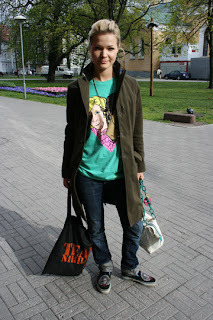 Konstantin’s style is old school, while I like wearing very colourful clothes. As we go to London quite often, we like to go shopping there. 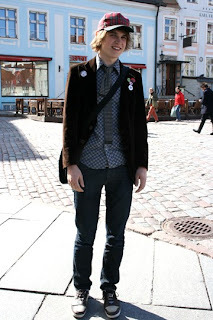 I think Estonians dress quite well and you cannot compare our street style to such cities as London and Paris, because there are many more places to shop. Very often people are forced to buy some trends, for example these skinny jeans. They are everywhere so sooner or later, if you want to buy new jeans, you need to get those. We prefer to read lifestyle and design magazines. We don’t buy from one particular label, because very often trousers may fit perfectly but shirts have weird sizing and so on. 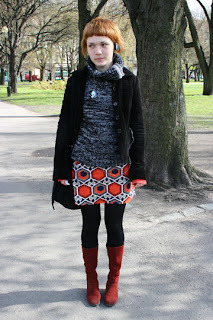 I think an essential part of my style is mixing different patterns and colours. 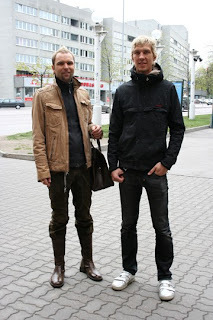 Estonian streetstyle is bit dull and people should wear more colorful clothes, but there are some really stylish Estonians, e.g. Heidy Purga. For ideas, I browse different fashion magazines. My current favourite is British Elle. 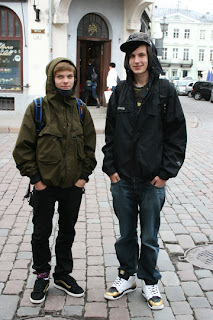 Very many people listen hip-hop here, but there isn't a proper hip-hop subculture in Estonia. There aren't many girls involved. I mostly shop at Motel Paradise, but also at Zara. I think female rappers are usually very stylish, for example Lil Mama. Our style is hip-hop, so clearly it is affected by music we listen. In Tallinn we mostly shop at Motel Paradise and Surfhouse. We like for example Vans. Why do you need a style icon, if you can be your own. I really don't care much about fashion. Sometimes when I walk around I notice some cool, or on the contrary, really terrible outfits, but otherwise I don't "scan" everyone out there. I always try to wear some colour.